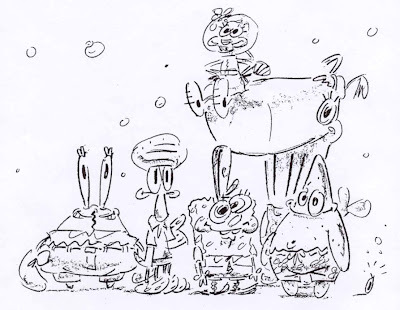 Cartoon historian Tom Heintjes is sharing the results of his wonderful new project; a comprehensive oral history of the SpongeBob SquarePants show. Tom interviewed many many key players who were with the show from the very beginning. The best part of this HUGE article is that the discussions dig down into the nitty gritty of the way the show was put together. Interviewees include Tom Kenny (voice of SpongeBob), Creative Director Derek Drymon, Supervising Director Alan Smart, Storyboard Artist/Writers Paul Tibbitt, Erik Wiese, Jay Lender, Mark O'Hare, Kent Osbourne, Sam Henderson, Kaz, myself, background designer Kenny Pittinger, and many other talented people where were part of the creative process that turned a silly little sponge into a timeless cartoon series and unexpected pop-culture phenomenon.